Dandy Curb Sack is the perfect choice for curb and gutter filtration. This is a very popular, rugged product that is capable of handling both large and small projects and can be used many times over. Dandy Curb Sack offers an open top design making it very easy to fit on any size inlet for a gutter or curb. Its excellent designing allows for great filtration of heavily sedimented water. The solid sediments will settle out of the flow and will be immediately captured by the Dandy Curb Sack before ever reaching the inlet. This is such an excellent product, you will be using it for all your projects. • Due to its excellent patented design, sediment, debris, and silt will stay out of the storm system. • Adapts to the shape of the curb. • It's made from a high-visibility monofilament geotextile. • Eliminates the need to flush or clean the inlets. • Comes in various sizes to fit any curb inlet. • Optional oil absorbents are also available. • This product is easy to install, inspect, and reuse. You will save a great deal of time, money, and frustration by installing a silt sack prior to construction. • Remove the grate from the catch basin and stand it on end. • Remove the top by lifting the straps out of the way and place the grate into the sack. • Ensure the grate is located below the top straps and above the lower straps. • Place the top straps back in place so they are on top of the grade. • Hold the top straps and carefully insert the Dandy Curb Sack into the grate frame. • Make sure the cylindrical section is placed against the curb to prevent debris, sediment, and silt from getting into the inlet. • You must remove debris and sediments away from the area after each storm. • On a regular basis as well as after storms, examine the Dandy Curb Sack. • If the contaminated area has more than 1/3-full of sediments, the unit must be emptied. • Just lift the unit out of the inlet using the lifting straps. • If using the optional absorbents, once the pillow is close to saturation replace it. Silt Sack Products is very proud to introduce their newly designed Dandy Pop for protecting storm drains and diverting stormwater away. 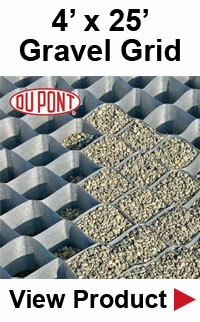 This product is designed for field grates to filter out heavily sedimented waters and will pop up within seconds. There is absolutely no need for awkward silt fences or similar devices that easily fall down or has infiltration points. It is literally hassle-free! The Dandy Pop is exactly what you are looking for. It completely encloses the grate which eliminates sediment infiltration. The solids will settle out and will be easily prevented from getting into the inlet. • Machine Operators will spot the Dandy Pop very easily. • Its excellent dome design makes it very easy to clean and maintain. 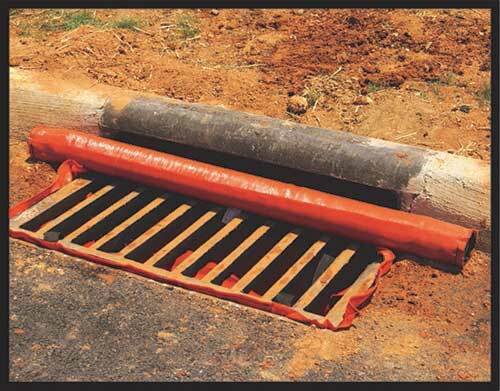 • Made from an easy to see safety orange and black monofilament geotextile. • Comes in standard sizes to fit any grate during installation. • Simply pop open the Dandy Pop near the inlet. • If using the optional oil absorbents, place the absorbent pillow on the bottom of the unit. • Remove the grate from the frame and place it into the Dandy Pop. • Pull up on slack and seal the Velcro to enclose the grate. • Take the lifting straps and insert the grate onto the inlet. • Ensure the grate sits completely inside the frame. • When needed, remove all sediment that has accumulated within the containment area. • If using optional oil absorbents, remove and replace the pillow when it becomes saturated. Soil will absorb stormwater which is either rainfall or melted snow that runs off streets and lawns. It will either replenish aquifers or will flow into streams and rivers. Unfortunately, in developed areas, the constructed surfaces will prevent absorbency into the ground. The water will, inevitably, end up in storm drains and sewers. Adding driveways, parking lots, and getting rid of grassy areas in yards will seriously impact the ability to control snow and rain waters. Stormwater will cause damage through flooding, eroding river banks, cause sewers to overflow, and destroy animal habitats. It will also lead to the contamination of rivers, streams, and coastal waters. Stormwater is not something to be ignored and should be taken very seriously. Your city's drinking water can be at high risk from gathering pollutants, trash, sediment, chemicals, and other harmful elements that will enter the city's reservoirs. As an example, Flint Michigan went through a serious water crisis. Residents did not have clean water for a number of years because they did not control stormwater runoff. There are many approaches that can be taken to stop the flow of sediments and other elements that have collected in water. There are also many ways that people can reach out and help out the environment such as making your home more environmentally-friendly. The term green roof means a rooftop area that has a garden. Green roofs actually work best in cities where the roofs are flat. Most residential homes are not designed with flat roofs so how about planting a garden in your yard. Plant some trees that are not only beautiful to look at, but provide all of us creatures on earth with oxygen! While designing your garden, consider placing rain barrels in various locations to collect rainwater and then water your plants. This is a substance that allows water to pass through it such as pervious concrete, porous asphalt, paving stones, etc. So, if you are in the market for a driveway, consider using permeable materials that will help the environment and protect your water system as well. These are wide and shallow channels created to slow runoff and promotes infiltration that will filter pollutants and sediments. These swales are vegetated along the bottom and sides of the channels. 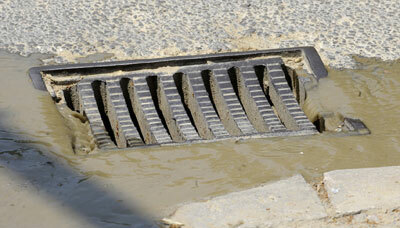 Your gutters and curbs are also huge collectors of polluted rainwater. You might not be able to control what lands in your rainwater but you can stop the water from collecting sludge, debris, and sediments, that will eventually land in your sewer. If what happened in Flint Michigan bothers you, it's time to take action to avoid situations like this and make sure this is not something that should ever happen again.